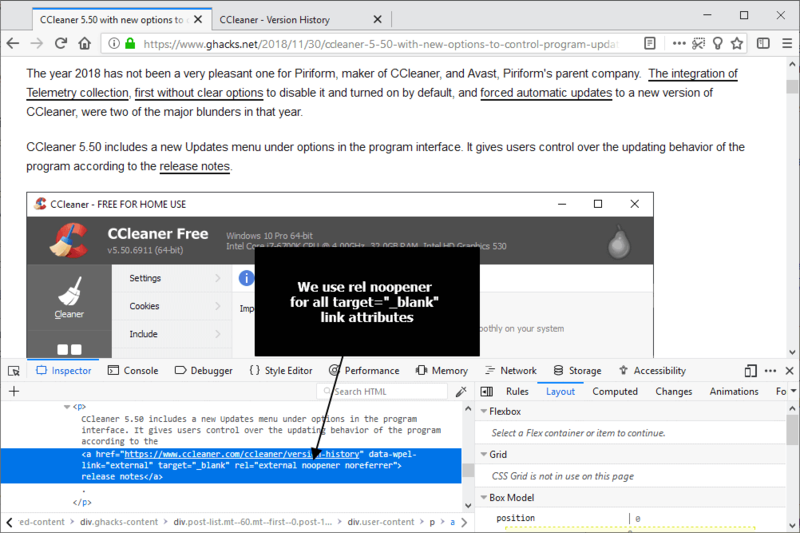 Mozilla is testing a new security feature in Firefox Nightly currently that adds rel="noopener" automatically to links that use target="_blank". Target="_blank" instructs browsers to open the link target in a new tab in the web browser automatically; without the target attribute, links would open in the same tab unless users use built-in browser functionality, e.g. by holding down Ctrl or Shift, to open the link in a different way. Rel="noopener is supported by all major web browsers. The attribute makes sure that window-opener is null in modern browsers. Null means that it contains no value. If rel="noopener" is not specified, linked resources have full control over the originating window object even if the resources are on different origins. The destination link could manipulate the originating document, e.g. replace it with a lookalike for phishing, display advertisement on it or manipulate it in any other way imaginable. You can check out a demo page on rel="noopener" abuse here. It is harmless but highlights how destination sites may alter the originating site if the attribute is not used. Rel="noopener" protects the originating document. Webmasters can -- and should -- specify rel="noopener" whenever they use target="_blank"; we use the attribute on all external links here on this site already. The preference dom.targetBlankNoOpener.enable controls the functionality. It is only available in Firefox 65 and set to true by default (which means that rel="_noopener" is added). Load about:config?filter=dom.targetBlankNoOpener.enable in the browser's address bar. A value of true means that rel="noopener" is added to links with target="_blank", a value of false that it is not. I always hover the mouse over links to see where they’re going to take me before clicking them. I notice as well that Startpage opens links in a new tab by default although this can be changed in the settings. Highly recommend this addon to everyone, especially noob users who don’t want to bother with the complecated regexes of the redirection rules. Are you implying that I’m a “noob user” then? I don’t see why <<>> shouldn’t be used. It’s totally logical to send users to another tab/window if the link is pointing to a different domain or site. Being a web designer I use it all the time. Whilst opening clicks I use the middle button in firefox & it opens the link in a new tab. you’re a moron, like all web designers are, this is why Firefox had to implement this because of morons like you making decisions on users behalf. I make decisions based on how & other people I know surf & of course, what the client wishes. Firefox is the one that is making decisions on users behalf. Nobody is saying that target=_blank shouldn’t be used, nor is anyone stopping it. What this change is doing is preventing that target from modifying the page that it was followed from if rel= is left blank, because that is a mechanism that is commonly used by attackers. You can easily ensure that your original code works as it always has by setting rel= to something (anything other than noopener will do). The tag was : target=_blank but enclosed in the arrows seems to make it disappear. Thanks for explaining that, I understand better the process. based upon your screen capture of about:config, you left out the “d” at the end of dom.targetBlankNoOpener.enable in your article’s text (2 instances). In most mainstream user agents, normally using the target name _blank, loads the designated document in a new, unnamed window. However, it “breaks” the Back button, which can cause Web Accessibility issues. The point is that the choice of whether a link will open in a new window (or tab) should be the end user’s choice, not the Web Author’s choice. If you (Web Authors) use target name _blank, you should include a warning in the text describing a control, i.e. warning text about opening in a new window instance, etc. If the Web Author does use target name _blank then “noreferrer” indicates that no referrer information is to be leaked when following the link. Therefore it makes sense that the Browser vendor Mozilla is doing such testing as implying: rel=”noopener” as default to such links. So what happens when I add this to FF 63? Will it be ignored? What I find even more fascinating than this obvious security hole in all modern browsers is the fact that we never heard about any serious exploit in this direction. Seems while it’s a serious problem in theory, the opener is not really being abused.